Cover art by Jenn Betchel. For the last year, I’ve been working hard on my second larp, In Residency, a short larp about the trials and tribulations of making art and hanging out at an artists colony. The final script is now up for sale at DriveThruRPG for the cheaper-than-movie-ticket price of $5.99. In Residency is an American Freeform game for 10-16 players about the relationship between trauma and art, and about the weird atmosphere of artists’ colonies, where intensely personal daily work rubs up against a claustrophobic cocktail-party environment at night. Brython: it’s where we’re all alone together. For residents at this elite artists’ colony, Brython represents the chance to live full time as their most secret selves, ignoring everything but their sacred drive to elevate the soul through art. By day, they make art in the beautiful surroundings of a fully staffed mansion, transforming their dark pasts into beauty. By night, they live in a fishbowl of observation and unresolved sexual tension. Will they overcome impostor syndrome to work on the projects they said they would? Will their off-colony relationships survive? Or will it all degenerate into Bacchanalia? Venue: A room large enough to contain the players and move around in comfortably, preferably with a little furniture; two adjacent rooms if possible. Player type: You enjoy taking initiative and pushing your character attributes to make interesting play for yourself and others. You enjoy the themes of gossip, romance, trauma, and art, and you sometimes find it fun to fail in game. Organizer type: You’re laid back and can run a good workshop and enjoy helping people create meaty characters. You’ll start and end scenes and control the crowd during interludes. If you choose, you can play as well, pushing drama from within. You’re as strict as a boarding school nun when it comes to keeping time. If you run it, I’d love to hear from you in the comments or via email (lizzie.stark@gmail.com). Sound like fun? Get a copy of In Residency over at DriveThruRPG! 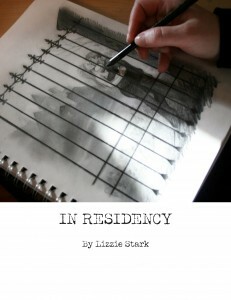 This entry was posted in Uncategorized and tagged American freeform, In Residency, Larp by Lizzie Stark. Bookmark the permalink.